In this blog, I want to help people create the best architecture combining these two worlds. Are you ready? Here we go! You will build an Angular 5 client that consumes a RESTful Web API Core 2 service. In this blog post we are assuming the reader already has basic knowledge of TypeScript, Angular modules, components, and importing/exporting. The goal of this post is to create a good architecture that will allow for the code to grow over time. Let’s start by choosing the IDE. Of course, this is just my preference, and you can use the one you feel more comfortable with. In my case, I will use Visual Studio Code and Visual Studio 2017. Why two different IDEs? Since Microsoft created Visual Studio Code for the front end, I cannot stop using this IDE. Anyway, we will also see how to integrate Angular 5 inside the solution project, that will help you if you are the kind of developer who prefers to debug both back end and front with just one F5. 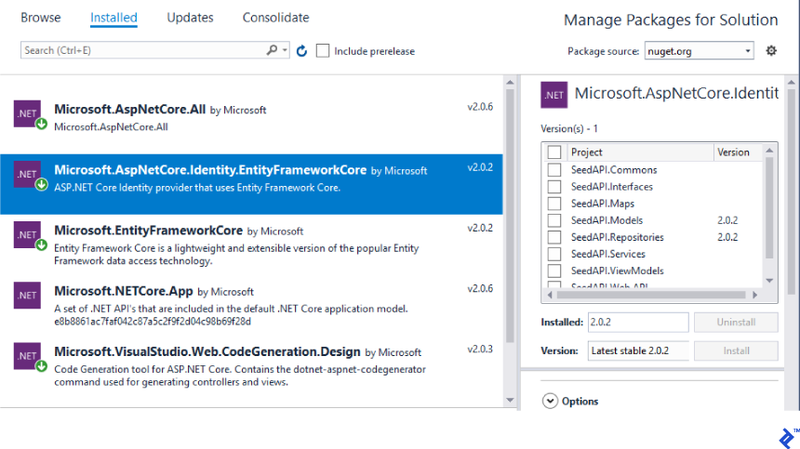 About the back end, you can install the latest Visual Studio 2017 version which has a free edition for developers but is very complete: Community. Verify that you are running at least Node 6.9.x and npm 3.x.x by running node -v and npm -v in a terminal or console window. Older versions produce errors, but newer versions are fine. A new folder called dist will be created and we can serve it using IIS or whichever web server you prefer. Then you can type the URL in the browser, and…done! It is not the purpose of this tutorial to show how to set up a web server, so I assume you already have that knowledge. 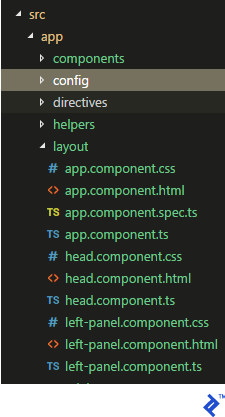 My src folder is structured as follows: Inside the app folder we have components where we will create for each Angular component the css, ts, spec, and html files. We will also create a config folder to keep the site configuration, directives will have all our custom directives, helpers will house common code like the authentication manager, layout will contain the main components like body, head, and side panels, modelskeeps what will match with the back-end view models, and finally services will have the code for all the calls to the back end. Outside the app folder we will keep the folders created by default, like assets and environments, and also the root files. Let’s create a config.ts file inside our config folder and call the class AppConfig. This is where we can set all the values we will use in different places in our code; for instance, the URL of the API. Note that the class implements a get property which receives, as a parameter, a key/value structure and a simple method to get access to the same value. This way, it will be easy to get the values just calling this.config.setting['PathAPI'] from the classes that inherit from it. Before starting the layout, let’s set up the UI component framework. Of course, you can use others like Bootstrap, but if you like the styling of Material, I do recommend it because it’s also supported by Google. The second command is because some Material components depend on Angular Animations. I also recommend reading the official page to understand which browsers are supported and what a polyfill is. The third command is because some Material components rely on HammerJS for gestures. The idea is to open/hide the menu by clicking on some button on the header. Angular Responsive will do the rest of the work for us. To do this we will create a layout folder and put inside it the app.component files created by default. But we will also create the same files for each section of the layout like you can see in the next image. Then, app.component will be the body, head.component the header, and left-panel.component the menu. Basically we will have an authentication property in the component which will allow us to remove the header and the menu if the user is not logged in, and instead, show a simple login page. But what about the TypeScript code for app.component? We will leave a little mystery here and pause it for a while, and come back to this after implementing authentication. Okay, now we have Angular Material helping us with the UI and a simple layout to start building our pages. But how can we navigate between pages? In order to create a simple example, let’s create two pages: “User,” where we can get a list of the existing users in the database, and “Dashboard,” a page where we can show some statistics. Note that dashboard is our page by default, so if the user types the URL /, the page will redirect automatically to this page. Also, take a look at the canActivate parameter: Here we are creating a reference to the class AuthGuard, which will allow us to check if the user is logged in. If not, it redirects to the login page. In the next section, I will show you how to create this class. Now, all we need to do is create the menu. Remember in the layout section when we created the left-panel.component.html file to look like this? Here is where our code meets reality. Now we can build the code and test it in the URL: You should be able to navigate from the Dashboard page to Users, but what happens if you type the URL our.site.url/users in the browser directly? A routed application should support “deep links”. A deep link is a URL that specifies a path to a component inside the app. For example, http://www.mysite.com/users/42 is a deep link to the hero detail page that displays the hero with id: 42. 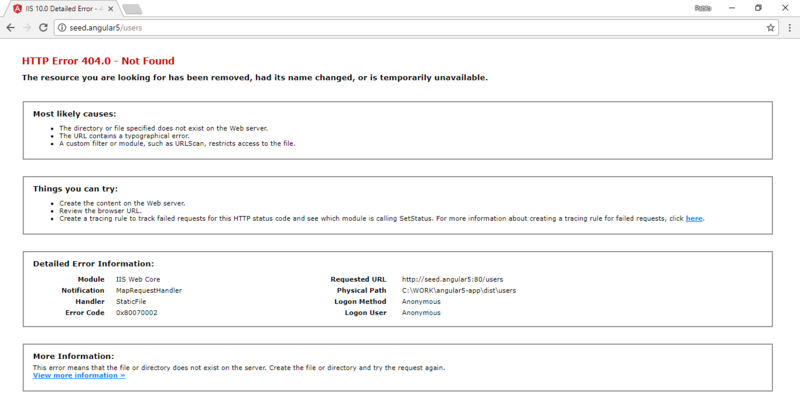 A static server routinely returns index.html when it receives a request for http://www.mysite.com/. But it rejects http://www.mysite.com/users/42 and returns a 404 – Not Found error unless it is configured to return index.html instead. To fix this issue is very simple, we just need to create the service provider file configuration. Since I’m working with IIS here, I will show you how to do it in this environment, but the concept is similar for Apache or any other web server. So every time we change the page the method canActivate will be called, which will check if the user is authenticated, and if not, we use our Router instance to redirect to the login page. But what is this new method on the Helper class? Under the helpers folder let’s create a file helpers.ts. Here we need to manage localStorage, where we will store the token we get from the back end. As you can see, for the moment we’ve hard-coded our credentials here. Note that here we are calling a service class; we will create these services classes to get access to our back end in the next section. Finally, we need to go back to the app.component.ts file, the layout of the site. Here, if the user is authenticated, it will show the menu and header sections, but if not, the layout will change to show just our login page. So every time we make an HTTP call, we implement the header of the request just using super.header. If the token is in localStorage then it will be appended inside the header, but if not, we will just set the JSON format. Another thing we can see here is what happens if authentication fails. The login component will call the service class and the service class will call the back end. Once we have the token, the helper class will manage the token, and now we are ready to get the list of users from our database. To get data from the database, first be sure we match the model classes with the back-end view models in our response. 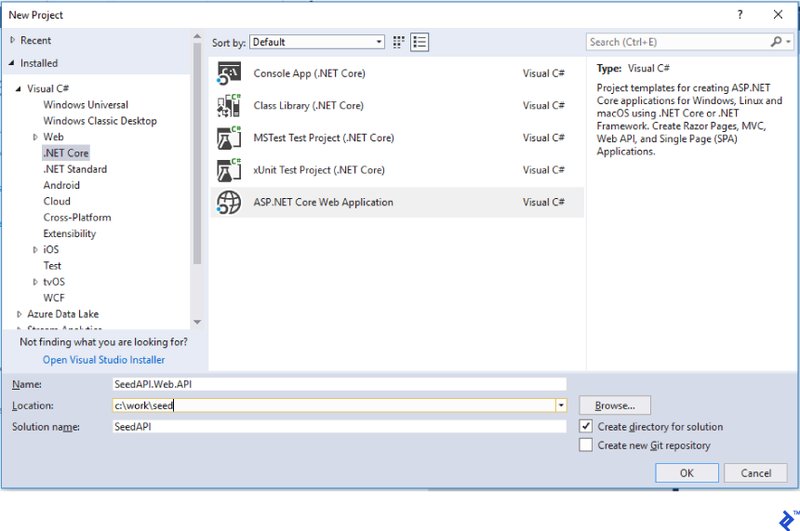 Welcome to the first step of our Web API Core 2 application. 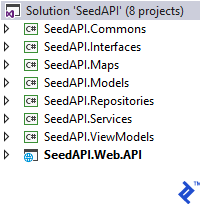 The first thing we need is to create an ASP.Net Core Web Application, which we will call SeedAPI.Web.API. 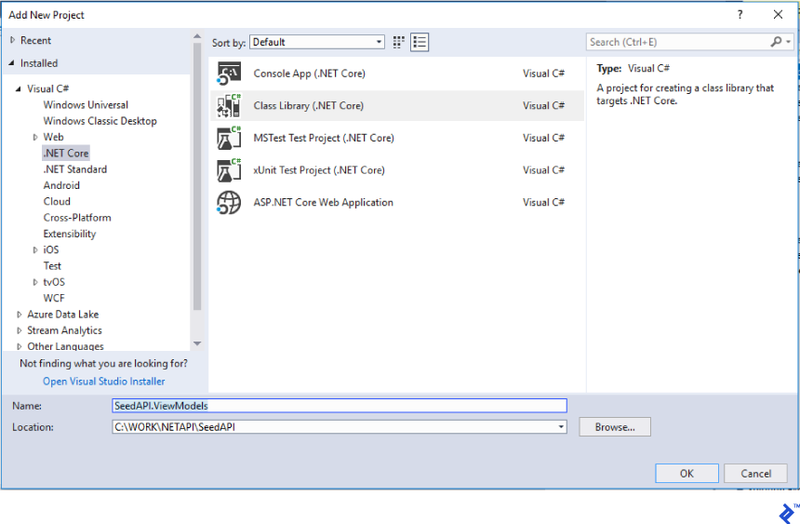 To do this, for each one just right-click the Solution and add a “Class Library (.NET Core)” project. 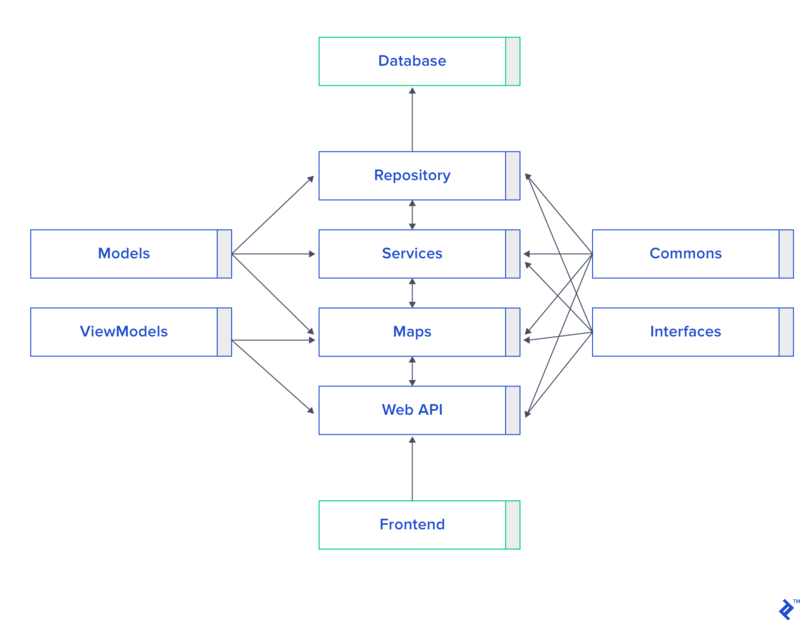 Web.API: This is our startup project and where endpoints are created. Here we will set up JWT, injection dependencies, and controllers. ViewModels: Here we perform conversions from the type of data that controllers will return in the responses to the front end. It is a good practice to match these classes with the front-end models. Interfaces: This will be helpful in implementing injection dependencies. The compelling benefit of a statically typed language is that the compiler can help verify that a contract which your code relies upon is actually met. Commons: All the shared behaviors and utility code will be here. Models: It is a good practice not to match the database directly with the front-end-facing ViewModels, so the purpose of Models is to create entity database classes independent of the front end. That will allow us in future to change our database without necessarily having an impact on our front end. It also helps when we simply want to do some refactoring. Maps: Here is where we map ViewModels to Models and vice-versa. This step is called between controllers and Services. Services: A library to store all the business logic. Repositories: This is the only place where we call the database. In this section, we will see the basic configuration of token authentication and go a bit deeper on the subject of security. The BuildToken method will create the token with the given security code. The Authenticate method just has user validation hard-coded for the moment, but we will need to call the database to validate it in the end. 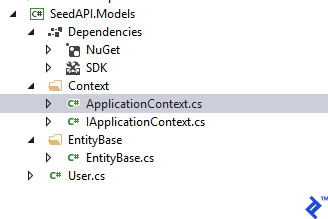 Using the Models project we can create here inside the Context folder two files, ApplicationContext.cs and IApplicationContext.cs. Also, we will need an EntityBase class. We are really close, but first we, will need to create more classes, this time in the App_Start folder located in the Web.API project. The first class is to initialize the application context and the second one is to create sample data just for the purpose of testing during development. It is a good practice to use dependency injection to move among different projects. This will help us to communicate between controllers and mappers, mappers and services, and services and repositories. Look how the Authorize attribute is present here to be sure that the front end has logged in and how dependency injection works in the constructor of the class. We finally have a call to the database but first, we need to understand the Map project. Looks like once more, dependency injection is working in the constructor of the class, linking Maps to the Services project. We’re getting to the last section of this tutorial: We just need to make calls to the database, so we create a UserRepository.cs file where we can read, insert, or update users in the database. In this article, I explained how to create a good architecture using Angular 5 and Web API Core 2. At this point, you’ve created the base for a big project with code that supports a large growth in requirements. 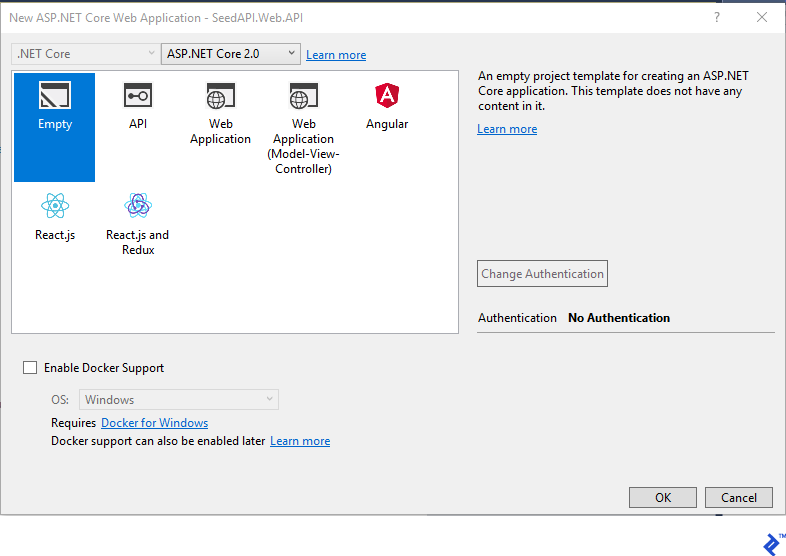 If you are working in a team of Angular developers probably there could be different developers working in the front end and the back end, so a good idea to synchronize the efforts of both teams could be integrating Swagger with Web API 2. Swagger is a great tool to document and test your RESTFul APIs. Read the Microsoft guide: Get started with Swashbuckle and ASP.NET Core. 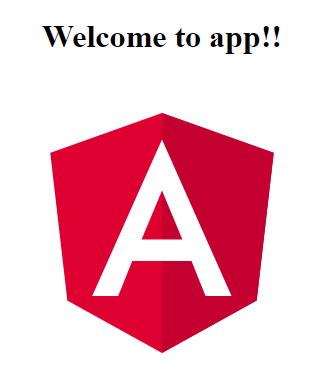 If you’re still very new to Angular 5 and are having trouble following along, read An Angular 5 Tutorial: Step by Step Guide to Your First Angular 5 App by fellow Toptaler Sergey Moiseev.